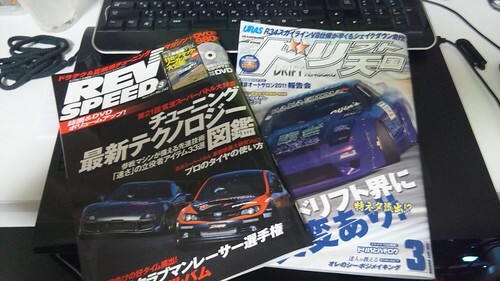 Here are 2 of my favorite Magazines in Japan so far, REV Speed & Dorifto Tengoku (レブスピード と　ドリフト天国). I use these magazines to help my Japanese study but they have a lot of content which can be understood by photos alone. These 2 magazines basically complete what I`m most interested in. REV Speed (レブスピード) has a lot of technical information for those interested in Time Attack and ways of shaving those tenths of seconds off your time. That and newer tuning cars and technologies used by all the top tuners around Japan. The price for this particular magazine is 980yen, which may seem high but also comes with a DVD. I think the quality of the content though is worth the price. Dorift Tengoku (ドリフト天国) Is of course as the title says, a drifting orientated magazine from Option Magazine. A lot of nice features photos, event posting, parts etc. Basically all you need for anything drift. This one goes for 550yen so you can`t go wrong with the price.